The holidays are a time best enjoyed together. 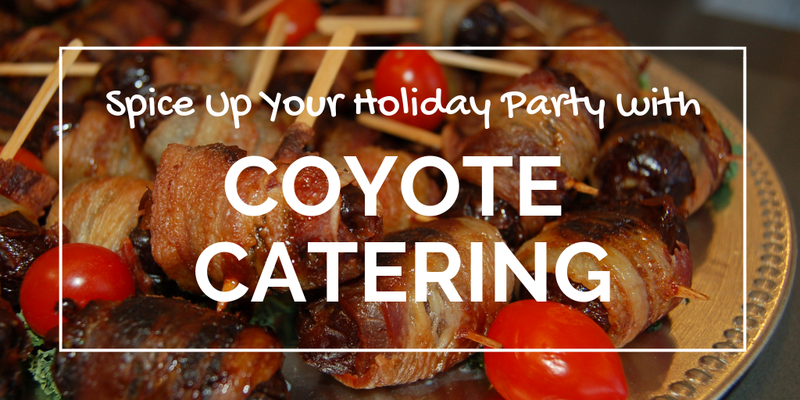 Coyote Catering understands that each party is unique, whether it be an annual company party, a private house party or dinner we will help you make it a smashing success. Tatjana has curated a list of things to think about in your planning process. WHEN SHOULD WE HAVE THE PARTY? We gladly accommodate mid-week holiday parties, as well as early- or late-season dates. If your team is more available in November, we’re excited to help you celebrate early. If a January holiday party makes more sense, our expert holiday events team can make that happen too. We cater for holiday parties when it is most convenient for YOU!! With drop-off catering, we bring your office holiday party food right to you and return to clean up later. With a fully staffed event, we are right there on-site to set up your holiday party, serve your delicious holiday food and clean up after you’re done. We’re determined to bring together the spirit of the holidays with great holiday food for your company this season. Your holiday party experience is more than great food. Our holiday event team goes above and beyond catering to include turnkey services including decorations, linens, tableware rentals, staffing. From holiday catering packages and brunch menus to passed hors-d’oeuvres and plated dinners, Coyote Catering menus have so many options to choose from. What can you look forward to this year? Back by popular demand, delicious holiday appetizers, sides, and desserts that are sure to delight your taste buds and your guests.